You've chosen your curriculum, you know your goals and your ready to start homeschooling. So where do you start? A good plan can make a huge difference between a smooth successful start and a panicked morning of gathering materials and printing assignments. You'll first need to decide what kind of planner system do you need? Online? Printed? What do you want to include? Web links? Do you like to do it all at once or little by little? You can use a planner program or create your own. You have a few options. Download a planner form or template. Create your own in Word or Excel. Her site may be a bit complicated, but so worth it! She has so many templates and forms in different fonts, you're sure to find something to fit your needs. Most of them are in Excel or Word format. Ultimate Free Homeschool Deals has a bunch of links to downloadable/printable forms and planners. They have lots of cute styles to choose from. Ready made lesson plans, charts and more that can be downloaded directly into your Office program. I especially like this Project-Based Lesson Plan Template. This weekly lesson plan is colorful and simple. 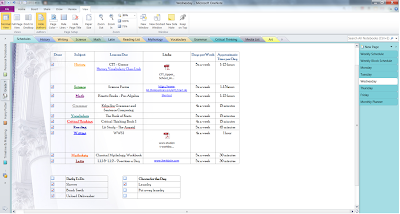 FREE online lesson planner, scheduler, and tracking system. The system has an automatic scheduler so you don't have to do a thing if an activity/lesson is missed. Regular version downloadable & FREE. Plus version has a one time fee and includes enough extra flexibility through grading, tracking and sharing capabilities to make it worth checking out. Once you've planned out your lessons. Look into an easy way to implement them. A popular way is the Workbox System. There's a bunch of information our there about this system. If your looking for inspiration, just Google Workbox System and look at all the beautiful organization.....sigh. The Originator of the this system. She has a downloadable eBook to guide you through the process. A Squidoo article that explains it simply and with pictures. Example of her setup with printables and how-to's. Beautiful Setup of the Workbox System using Ikea Storage. I'm not the most organized person, so I needed a system that would allow me to do most of the work upfront, but give me some flexibility in case we got behind in one subject. First I started with an overview of the plan for the year. I made an outline of what topics I planned to cover each month to make sure I didn't over or under schedule. I took a look at the curriculum and counted the number of chapters or pages and divided by 36 to get an idea of what would be required every week. After a lot of trial and error, I finally found the simplest method was the one that would work for us. A basic table allows us to quickly view what is scheduled for the day with more of a do-the-next-thing type of planning. 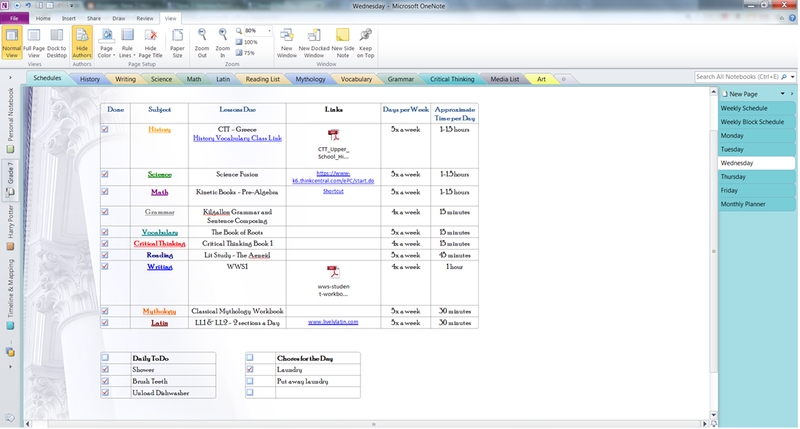 The subject tabs up top have more information than the general schedule. Many didn't need anything more than the table of contents to be copied and pasted and then have checkboxes next to each line. Some subjects required more thought and planning, using the side tabs for chapters or weeks. I made these tables in OneNote so I can easily share the whole lesson plan with him on his laptop. In OneNote, I could make the table as large as I needed without being forced to stay at 8.5 x 11, giving me the flexibility I needed. I really think OneNote is an easy and flexible way to plan. You can enter videos, audio, pictures, and links directly into the page. By sharing your notebook through the web or network, everything that is updated on one notebook is instantly updated on the other. This helps your student gain some independence and still allowing you to monitor from a distance.